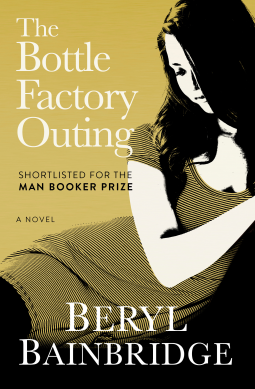 I’ve recently read The Bottle Factory Outing by Beryl Bainbridge and I enjoyed it immensely. At night when they prepared for bed Freda removed all her clothes and lay like a great fretful baby, majestically dimpled and curved. Brenda wore her pyjamas and her underwear and a tweed coat. Brenda desperately tries to escape the the amorous attentions of Rossi, the factory manager – as Freda says Brenda is a born victim, who’s asking for trouble. But it’s not just Brenda who runs into trouble. Freda, who is in love with Vittorio, the trainee manager and nephew of the factory owner, organises a factory outing in the hope that she can seduce him, but the outing goes from bad to worse.The van arranged to take them to a stately home fails to turn up so only those who can fit into two cars set off, then there are fights at Windsor Castle, and a bizarre visit to a safari park. Passions rise, tempers flare, barrels of wine are consumed and it ends in violence and tragedy. The book begins as a comedy, but then continues with an uneasy undercurrent as the outing gets under way before descending into a dark tragedy that is surreal and farcical and also desperately sad. Beryl Bainbridge’s writing, so easily readable, is rich in descriptions. The book is superbly paced; the tension rises in an atmosphere of seediness, and frustration, before reaching an unbelievable and grotesque climax. I had no idea how Bainbridge could draw this story to an end and was completely taken by surprise at the bizarre twist at the end, which I thought was brilliant. It’s savagely funny, full of pathos, touching moments, frustrations, shame, stress and unhappiness, all combining to make this a most entertaining book. Beryl Bainbridge (1932 ‘“ 2010) was made a Dame in 2000. She wrote 18 novels, three of which were filmed, two collections of short stories, several plays for stage and television, and many articles, essays, columns and reviews. Five of her novels were nominated for the Booker Prize, but none of them won it. Years ago before I began writing BooksPlease I read two of her books, historical novels, one being According to Queenie, published in 1999, a novel about the life of Samuel Johnson as seen through the eyes of Queeney, Mrs Thrale, and the other Master Georgie, published in 1998, set in the Crimean War telling the story of George Hardy, a surgeon. Since then I have read three more of her books and loved each one – A Quiet Life, published in 1976, a semi-autobiographical novel, using her own childhood and background as source material; An Awfully Big Adventure, another semi-autobiographical novel set in 1950, based on Beryl Bainbridge’s own experience as an assistant stage manager in a Liverpool theatre, published in 1989 and shortlisted for the Booker Prize; and The Birthday Boys, a novel about Captain Scott’s last Antarctic Expedition, published in 1991. The Bottle Factory was inspired by Beryl Bainbridge’s experience working part time in a bottle factory in 1959. It was first published in 1974 and was shortlisted for the Man Booker Prize in that year. Thanks to the publishers, Open Road Integrated Media, via NetGalley for my copy of this ebook edition, featuring an illustrated biography of Beryl Bainbridge including rare images from the author’s estate. It’s due to be released in the US on 4 October. I’ve read a couple of Beryl Bainbridge’s books but can never decide whether I like her writing or not. I suspect it’s because they take me out of my crime, sci-fi, fantasy book comfort zone… which is no bad thing… I need to do more of that, but I’m not certain BB is the right author to do that for me. Glad you enjoy her books though. Which books of BB’s have you read? I’ve read An Awfully Big Adventure (and seen the Alan Rickman, Hugh Grant film, which is rather good) and According to Queeney. I have Master Georgie around *somewhere* too. I shall definitely try more of her books as I believe in persevering. Cath, I really enjoyed The Birthday Boys, historical fiction about Captain Scott’s last Antarctic Expedition. I’ve read a number of Bainbridge’s book (including this one) and I love the way she slowly and quietly builds a sense of unease that gradually becomes ominous. I recommend her very early novel (it might have been her first), HARRIET SAID, based on the Holme-Parker murder (later also the source for the movie HEAVENLY CREATURES). I love that sense of unease too. I haven’t read Harriet Said – I’ll look out for it. Thanks for the recommendation. I’m in the middle of this now. The last thing I expected this to have is an honest-to-goodness crime. I’m more intrigued than ever! Debbie, oh I hope I haven’t spoilt it for you! What a great review! I’ve never read anything by Beryl. You certainly got me wanting to now! Thanks, Sandra – I hope you enjoy whichever one you choose.